Did you know 60% of our business is from repeat customers? Established in 2007, we are a specialist screeding and underfloor heating contractor, directly employing 20 staff, including 14 professional tradesmen. Repeat business and word-of-mouth recommendation is important to us, which is why we carefully control service and installation quality by never subcontracting projects. We have four customer-centric installation teams, made up of skilled workers who are passionate about their trade, committed to installation best practice and proud to exceed expectations. That’s why we work hard to retain them as valued employees. Being based in the Midlands means we can easily service customers throughout the UK. In recent years we’ve developed a reputation as a key screeding contractor in London, serving clients in the capital and around the M25 corridor. A hands-on business owner and entrepreneur, James has climbed the ladder in the flooring industry, from shovelling screed, to starting Screed It in his late 20s. Having joined Screed It from the distribution sector, Mark overseas the daily running of Screed It, including supply chain management. 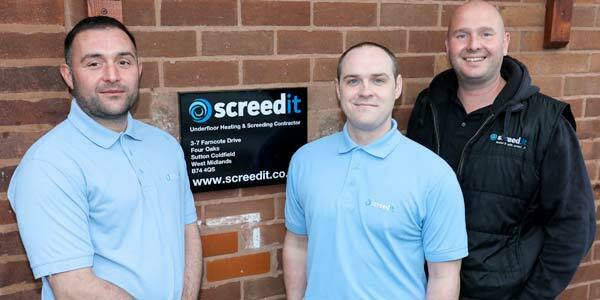 As the head of Screed It’s installation teams, Craig manages logistics and customer satisfaction.